Fota Island is home to no less than three top quality championship courses, and as such is one of the best golfing venues in Ireland. Set amidst the beautiful scenery of this corner of County Cork, the Sheraton Fota Island hotel is a real delight. All 131 bedrooms and suites are elegantly appointed, many of which allow superb views across the surrounding woodland and golf course. 1 in 8 Go Free! 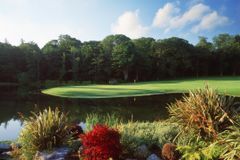 The renowned Fota Island Golf Club is set amidst the fantastic scenery of the estate itself. While golf on the site dates back to the 1800s, it was not until Christy O'Connor Jr. and Peter McEvoy laid out their new Deerpark course in 1993, that Fota Island became a serious golfing destination. Since its inception, the championship course has played host to the Irish Open in 2001, 2002 and 2014 and has established a reputation as one of Ireland's best. Finland's Mikko Ilonen led from wire-to-wire to claim his fourth European Tour title at Fota Island. Ilonen carded a final round of 70 to finish 13-under par, one shot ahead of Italy’s Edoardo Molinari, with Sweden's Kristoffer Broberg and English duo Danny Willett and Matthew Baldwin another shot back in third. The Belvelly's par-72 layout includes the new nine holes added by Jeff Howes in recent times, and is a formidable test at 7,121 yards from the back markers. Interesting features have been worked into the design, not least on the signature 16th hole, where visiting golfers face the challenge of firing their approach shot over an old quarry to a small target. The par-73 Barryscourt Course also takes in the new nine holes, and is the latest addition to Fota Island's impressive portfolio of golf. The course is a monster from the back tees, but the characteristic slope of the greens will also undoubtedly challenge the putting of every visitor. The highlight of Fota's latest course is the redesigned 8th, which features an array of hazards to be safely negotiated. The guest rooms feature luxury bonuses like state-of-the-art beds, internet access, and an interactive video system. The hotel has consistently built on its reputation as one of the premier 5-star hotels in the south of Ireland, with a great combination of facilities and customer service. This superb comfort makes Fota Island a fantastic choice for a golf break, and also for those who want to explore the incredible beauty of the local area. The 18 purpose-built treatment rooms of the Fota Island Spa are designed to offer the very best in health and beauty therapy. The facility focuses on well-being, and is run in conjunction with the exclusive Comfort Zone product range. In addition to the spa, the leisure centre offers a well-equipped gym and swimming pool. Eat in the Cove, a specialist seafood grill which uses fresh local catch. The Amber Lounge has a list of over 75 whiskies to choose from.